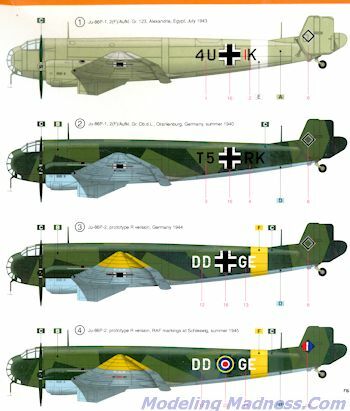 The Ju-86 was an early Luftwaffe bomber powered by diesel engines, but found to be inferior to the He-111 so produced in relatively small numbers. The aircraft was also built as a civil airliner and there were version powered by radial engines, which were mostly exported. It used in the 1939 invasion of Poland, but retired soon after. In January 1940, the Luftwaffe tested the prototype Ju 86P with a longer wingspan, pressurized cabin, Jumo 207A1 turbocharged diesel engines, and a two-man crew. The Ju 86P could fly at heights of 12,000 m (39,000 ft) and higher on occasion, where it was felt to be safe from Allied fighters. The British Westland Welkin and Soviet Yakovlev Yak-9PD were developed specifically to counter this threat. Satisfied with the trials of the new Ju 86P prototype, the Luftwaffe ordered that some 40 older-model bombers be converted to Ju 86 P-1 high-altitude bombers and Ju 86 P-2 photo reconnaissance aircraft. Those operated successfully for some years over Britain, the Soviet Union and North Africa. In August 1942, a modified Spitfire V shot one down over Egypt at some 14,500 m (49,000 ft); when two more were lost, Ju 86Ps were withdrawn from service in 1943. At least one was modified with longer wings for use in the Ju-86R program, which never got out of the prototype stage. This is a pretty complex kit for a short run kit and so is not something that will be finished in a weekend. 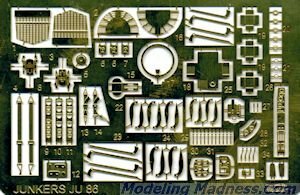 The kit includes several sprues of nicely engraved grey plastic plus a clear sprue as well as a photo etch fret. There is no resin. The photo etch fret is rather extensive and provided cockpit instruments, radio boxes, throttle quadrants, rudder pedals, seat harness and a lot of control handles. There are also radiator grilles, flap and aileron hinges, and several external access ports, including camera windows for the recce version. When one starts, one needs to know which markings option will be used. The kit lists the P-1 as the recce plane and the P-2 as one with longer wings. This does not jive with the reference, so one of them is in error. Suffice it to say that they are all photo recon planes, despite the instructions showing the P-1 without cameras. It makes no sense to have standard bombers assigned to reconnaissance units. The main difference between the two aircraft are longer outer wing sections and four blade props. These are not shown on the parts diagram, but are included in the kit. The cockpit is very nicely detailed if one has no fear of photo etch as most of the detail is in this material. In fact, nearly half of the instructions are concerning this part of the build. The tailplanes and fins are a single mold and the engine nacelles are made up of several pieces that include photo etch radiators fore and aft. The only thing holding on the ailerons and flaps on this kit are the photo etch hinges, and while it would have been nice to have really positive indentations on both the wings and ailerons/flaps, you will not have any issues attaching these parts. The clear bits are fairly well done and clear enough to see the work you have put into the cockpit area. There are two different side window pieces depending on which version you are making. 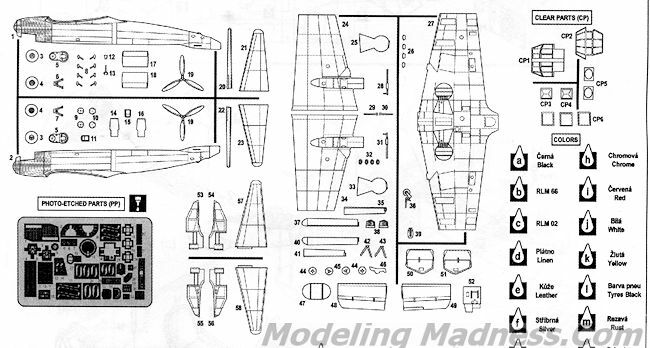 Instructions are nicely done and there is a separate section for doing the long wing version so you need to read through them before starting your build so that you don't start putting on the wrong bits for the version you want to build. Generic and RLM color information is provided in the color chart. There are four markings options. One is the box art plane in overall RLM 02 with 2(F)/Aufkl.Gr.123 that is says was based at Alexandria in 1943, but since that was occupied by the British, I doubt it. It probably operated out of Crete. White fuselage band and lower wing tips on this one. The other are all in RLM 70/71/65 splinter patterns. Option 2, another short wing plane was with 2(F)/Aufkl.Gr.Ob.d.L, operating out of Oranienburg, Germany in the summer of 1940. The long wing plane has two markings options that differ only in insignia. It was a prototype R variant with a yellow fuselage band and lower wing tips in Germany during 1944. The other is the same plane captured by the British after the war. Decals are nicely printed and do not include swastikas. 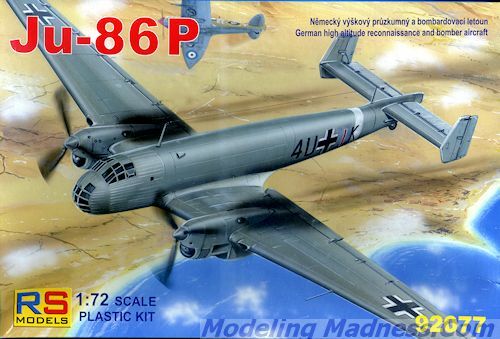 To me, this is the most interesting version of the Ju-86. I've built the Italeri kit and it was a neat plane, but they never did the pressurized version. Now we do have this aircraft available to us and those who are interested in the type and can handle the building of a somewhat complex short run kit like this will finally have one for display.